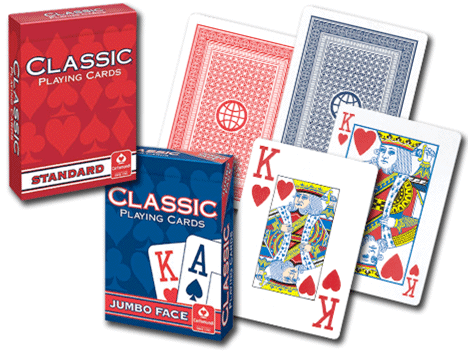 Cartamundi Classic Playing Cards – Great Value! Cartamundi Classic Playing Cards feature plastic-coated paper playing cards stock. At less than 80 cents per deck (at the gross quantity), Classic Cards are an excellent value-priced choice for card players. Classic Playing Cards feature a simple and stylish pattern back with an international/globe center design. Classic Playing Cards come poker size (2.5" x 3.5"), with regular or super index numbers and pips. For additional information or volume pricing on Cartamundi Classic Decks, please contact us at 1-800-233-0828.